It seems appropriate that the Propionic Acidemia (PROP) Nutrition Guidelines Nominal Group meeting in Atlanta, GA was held on a leap year, the weekend before 2016 Rare Disease Day. We have indeed leaped forward towards our goal of developing the PROP nutrition management guideline based on the feedback gained from the attendees. 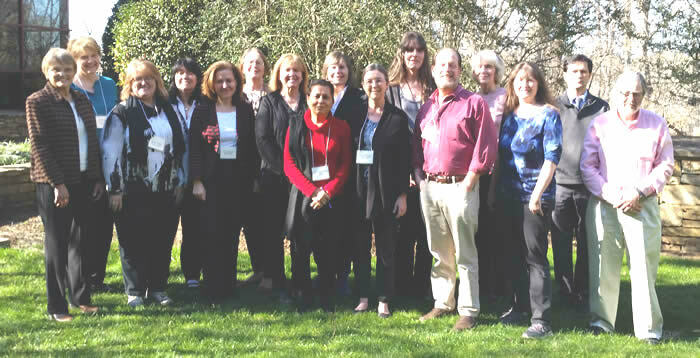 The goal of the Southeast Newborn Screening and Genetics Collaborative - Genetic Metabolic Dietitians International (GMDI) Nutrition Guidelines Project is: To develop nutrition guidelines for the management of genetic metabolic disorders for which there is little published scientific evidence. Evidence based medical practices should come from scientific findings gathered from randomized control trials (RCT) to guide clinical practice and treatments. RCTs require large numbers of participants to develop statistically significant conclusions, which is challenging to do with rare conditions such as PROP. Hence, most PROP publications are observational studies consisting of single cases or case series. In order to determine best Medical Nutrition Therapy for PROP, a group of experienced metabolic dietitians followed an evidence and consensus based methodology. The workgroup developed a multi-step process for guideline development known as the Delphi-Nominal Group-Delphi-Field Testing (DNDF) methodology1 , that includes a review of scientific and grey (unpublished) literature, a Delphi survey of practice, a nominal group meeting to clarify discrepancies, a formulation of recommendations and a second Delphi round to assess the degree of consensus with the proposed recommendations. External review and field testing are also built into the process. 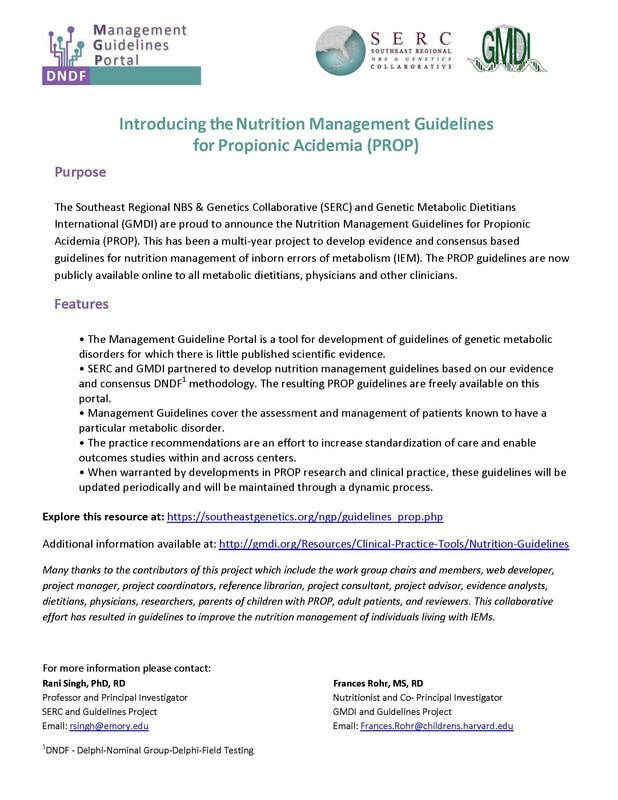 For PROP Nutrition Guideline, our workgroup of 65 indivduals have been involved in some aspect of the developmentof the PROP guideline, including 13 experienced GMDI metabolic dietitians, have been trained in evidence analysis and DNDF methodology. We evaluated ------ 1156 articles, of which 225 published articles and 25 grey articles (book chapters, etc.) met the criteria for inclusion. The articles were rated for quality and summarized; the areas of certainty for PROP MNT and uncertainty requiring more clarification were identified. The nominal group meeting included the following metabolic experts; 2 physicians, 4 dietitians, 1 physician researcher, and 2 parent group representatives to participate in discussion and review of preliminary PROP nutrition recommendations. Topics addressed included acute and chronic management, energy and protein requirements, nutritional supplements and interventions to optimize outcomes in various circumstances such as pregnancy and transplantation, laboratory values to monitor, and much more. Our next step is to implement another Delphi survey to further validate the nutrition recommendations. The final step will be to summarize and write the PROP Nutrition Management Guideline that will be made publically available and submitted to a metabolic journal for publication by December 2016. We will periodically update them as new evidence to support best clinical practices are discovered. In the future a PROP tool kit will be developed for practical implementation of the PROP Nutrition Management Guideline, including educational resources.This project is supported by a Maternal and Child Health Bureau HRSA grant #2-U22 MC010979. We greatly appreciate the contributions and support of the clinicians and the patient community to help us achieve this goal of improving MNT for people living with propionic acidemia, their families and caregivers.